Jaz Hackett has always been fascinated with food. As a child he could be found in the kitchen with his mom, watching bread rise, baking cakes and muffins, fully immersed in the experience. Jaz joined the Verdicchio team, fresh out of College Boreal’s Culinary Management Program in 2015. Learn more about Jaz in the next of our Meet Our Team series. 1. Describe your professional background. Include your schooling and/or where you grew up. 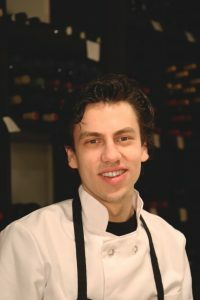 I am 20 years old and I have been cooking since I was 8, here in Sudbury. I also learned the importance of organization skills and standardization in the kitchen while working at McDonald’s between 2012 and 2015. I went on to complete the two year Culinary Management Program at College Boreal from 2014-2016. Then I started my school placement at Verdicchios in late February 2015. Two years later, I now find myself to be an important part of the Verdicchio team. 2. What inspired you to get in the kitchen? From a young age, I showed interest in the culinary arts. I was always asking my mother to help out in the kitchen, since I was about 4 years old, according to her of course. I remember loving to watch loaves of bread, cakes and muffins bake in the oven, not being able to wait until it cooled down to dig right in. For as long as I can remember, I’ve always been fascinated by food and fixed on the idea that I could make a life out of it. I had my eyes set on being a chef in a successful restaurant; always have. 3. Is working in a kitchen anything like we see in reality TV? In my opinion, not at all. All these shows we see on the Food Network are simply glorified exaggerations. The industry is tough. There is a lot that can go wrong in the kitchen, and they tend to avoid that truth. Certain chefs, such as Anthony Bourdain, are an exception for me. He thoroughly explains the good, the bad and the ugly about every aspect in the kitchen life. It’s entirely bitter-sweet, it requires a lot of patience and passion. 4. When you are not working, what do you like to do? I spend most of my time at home, listening to music and relaxing with some of my close friends. I also spend a lot of time in the kitchen at home, I can’t get enough of it. Being in my space allows me to experiment and make whatever my heart desires. But, the most rewarding thing is definitely having a few beers with my coworkers when we are off on the weekend, while we cook and eat, of course. In my opinion, it’s important to bond with your work team in the kitchen. 5. Fill in the blank. When I get home after a long shift, I…..
take off my work shoes, put down my bag and head to the beer fridge for a cold one. I take a shower, put on some clean clothes and see what the night has in store for me. Although I mostly work late nights, I’m normally too pumped with adrenaline to be able to fall asleep. I enjoy unwinding. 6. Where do you like eating in this city? Respect is Burning, The Laughing Buddha and of course Verdicchio’s are among my top favourite places. When I want comfort food I normally head to Vespa, Leslie’s and Gloria’s. There are a few hidden gems around this city. 7. Where do you envision yourself in 10 years? I honestly don’t really have an answer for that. Life is strange; it takes abrupt turns when you least expect it. But, I do see myself among higher ranks in the hierarchy of any kitchen, anywhere around the world. I would like to travel and get as much experience as I can. It all depends on what life has in store for me. 8. What is your favourite dish on the Verdicchio menu and why. For our current winter/fall menu, the Ossobucco is definitely my favourite dish on the menu. The venison is slowly braised using the sous-vide method, which is probably my favourite way to prepare anything. The meat is ridiculously tender, and the bone marrow is delicious and buttery. Paired with the saffron and mushroom risotto, and parsley and orange gremolata, this dish is something I recommend to everyone. 9. If you were on an island by yourself for one month and you could choose 3 items to take with you, what would you take? I’d take a tarp for shelter/raincatcher, one of my chef’s knives and a box of wooden matches. I’m only trying to be realistic, I’d like to survive the month. I have quite a few, but among my favourites are Alice and Wonderland 1951, Clerks, Waiting, Pulp Fiction, Fast Times at Ridgemont High, The Breakfast Club, The Warriors and The Hateful Eight. 12 Fill in the blank. I can’t work in the kitchen without…. Rags! Sounds silly, but they are too important. When you’re working during the rush, it’s hard to keep track of which pan handles are searing hot, and I can assure you the rag, at this point, is your best friend. Even when it comes to keeping work surfaces clean or final touches on plates that are about to go out to a table, you’re going to need a rag.